What would you do if the most important person to you had been kidnapped? One minute your daughter is there, and the next she has been bundled into a van right under your nose. They want something of your father’s. You don’t know what that is, and your father mysteriously disappeared over 7 years ago. Going to the police is not an option. And the answers will slowly appear in the most unlikely of places. You have to love a book that is shrouded in mystery as soon as you begin to read it and that is exactly what Jim Ody gives you. A puzzle, a kidnapping and a burial 7 years before that had to take place without a body! By now you are on the 5th page of the book. Pretty cool. Now time to rewind and see how it all came about. This is brilliant entertainment as I didn’t get quite what I thought I was going to get, I got much more. There is a tight bunch of characters so it is really easy to know where everyone fits into the story and you do get background to how they all came together. The story itself centres around Eddie, the disappearance of his father, Eddie’s daughter Daisy and a mix of his overlapping personal and professional life. Eddie is normally a very steady going fellow, certainly more forgiving and laid back than most. There is also some light humour in this book. I particularly liked the banter between Eddie and his next door neighbour. 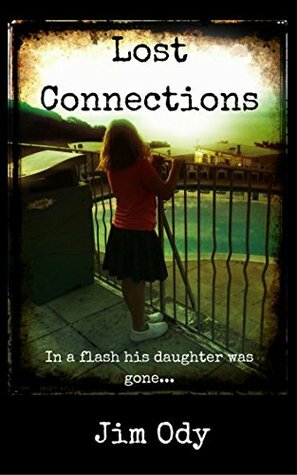 ‘Lost Connections’ is his first published book. Jim lives with his wife and three children in Swindon, Wiltshire, and is currently writing his next novel; and more than likely eating chocolate.